The maritime history of the Stellwagen Bank National Marine encompasses much of New England's history. As the Ice Age glaciers began retreating from eastern Massachusetts around 16,000 year ago, portions of Stellwagen Bank and Jeffreys Ledge were dry and home to grasses, forests, and Pleistocene animals. It is likely that between 11,000 and 12,000 years ago, Paleoindians inhabited these areas and exploited the rich marine resources found along the shore. Rising sea levels slowly inundated Massachusett's Bay, pushing the native populations to settlements along the current shoreline. For thousands of years Native Americans utilized the vast fish and shellfish resources of Massachusetts Bay developing rich cultures that were in harmony with the marine environment. During the thousands of years of human occupation of the Massachusetts' coastline, waterborne transportation was an essential part of the region's communication network. 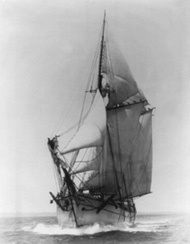 Vessels of many shapes and sizes have carried a variety of cargos and multitudes of persons to and from Massachusetts ports. Beginning with the native cultures and continued by the earliest colonists who cut settlements from the thick forests and fished along the shore, New Englanders have derived tremendous economic benefit from their close association with the sea. New Englanders have traveled the breadth of the globe in sailing ships, trading with far flung cultures or harvesting the bounty of the sea. At the beginning and end of each voyage, many of these intrepid mariners crossed through the waters that are now recognized as the Stellwagen Bank National Marine Sanctuary. 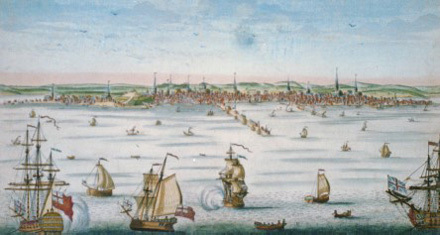 A view of Boston in the mid-1700s depicting the city's bustling maritime trade. Courtesy of the Library of Congress. 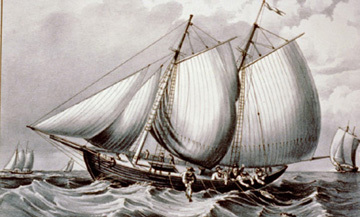 Whaling played an important role in the maritime heritage of New England. In the late 1500s Basque whalers came to the New World, and possibility as far south as Stellwagen Bank, but it was not until the 17th century, with shore based whaling in Massachusetts Bay, that whaling was a common activity along the East Coast. Small boats set out from the shores of Cape Cod in pursuit of North Atlantic right whales. Once harpooned, the whales were killed with a lance and then towed ashore where their blubber was rendered into oil. These activities hastened the decline of North Atlantic Right whale populations that has made them critically endangered today. Whalers departing from Massachusetts ports might be at sea for several years before retuning to port. Courtesy of the Library of Congress. 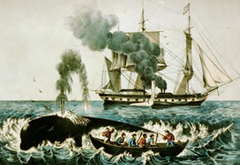 During the 18th and 19th centuries, larger whale ships departed from Massachusetts ports for whaling grounds far offshore. As whale populations diminished in the Atlantic Ocean, Massachusetts whalers rounded Cape Horn into the Pacific Ocean to find more whales. Today, whales are viewed in a different way. During the summer months, people board whale watching vessels to view these animals up close and appreciate their grace and power. Stellwagen Bank is one of the best places to observe feeding humpback whales in the United States. Whales in the sanctuary are no longer hunted; rather they are studied and enjoyed for their beauty. Passenger traffic across Massachusetts Bay steadily built from the 17th century to the 19th century as New England's economy and population grew. As the largest American city closest to Europe, Boston became a destination for many immigrants. Travel by sail was an uncertain affair. Prior to the institution of regularly schedules sailing packets, early 19th century, travelers might have waited weeks for their vessel to fill its hold or its cabins. Once started, these trips often lasted much longer than anticipated since even the fastest vessels could become oceanic prisons when the wind stopped blowing. During the 19th century, the application of steam propulsion dramatically transformed passenger travel. Passengers could now count on a departure time and journey length. Additionally, steamships were built with comfort in mind. Passengers enjoyed lavish meals and warm beds en-route to their destinations. Today, thousands of people cross Massachusetts Bay on high speed ferries that connect Cape Cod to Boston and on cruise ships that depart Boston for Bermuda, the Caribbean, Canada, and the New England coast. Steamships with lavish cabins and fine dining became the preferred way to travel on the ocean in the 19th and 20th century. Courtesy of the Library of Congress. A tremendous variety of vessels and cargos have passed through the sanctuary's waters. Whether a colonial brig trading between Salem and Jamaica or a clipper ship carrying tea from China foreign commerce was the life blood of New England until the American Civil War. After the Civil War, coastwise shipping of bulk commodities became the focus of New England's merchants. Carried on schooners, the American coasting vessel of choice since colonial times, cargos of granite and ice left Massachusetts Bay. Returning to New England, the schooners carried coal and lumber. While the era of sailing ships is long gone, Boston remains a busy port frequented by container ships, tankers, tugs, and barges. the turn of the century. Courtesy of the Library of Congress. For over 400 years, Massachusetts Bay has been a center for fishing activities. The area was first fished by Native Americans who collected a variety of marine foods along the water's edge. During the colonial period, fish played a large role as one of the region's main export commodities. The Pilgrims came to Plimoth colony with the intention of fishing, and many 17th century towns grew and prospered from this industry. As technology progressed, fishing vessels and fishing methods evolved to meet the demands of the market. The small rowed craft of the colonial period were replaced by swift schooners in the 18th and 19th century which were then replaced by engine driven trawlers in the 20th century. Today, fishermen travel from their home ports for Stellwagen Bank to harvest finfish and shellfish. Fishermen used hand lines to catch cod. The waters over and around Stellwagen Bank have been the scene of conflict several times during past centuries. Revolutionary War and the War of 1812 privateers, rum runners, and German submarines have all navigated the waters of Massachusetts Bay. The vitality and economic importance of Boston has attracted these less than peaceful activities. Patriots, outlaws, and enemy forces have all used the waters off Stellwagen Bank for attack and refuge. During Prohibition, many entrepreneurs converted a variety of vessels for the smuggling liquor. This lucrative but illegal "rum running" business involved larger vessels that anchored in Massachusetts Bay and transferred the alcohol into smaller craft that would carry the contraband products to shore. Bay. Courtesy of the United States Coast Guard. In October 1924, the United States Coast Guard squadron based in Boston discovered more than a dozen vessels waiting on Stellwagen Bank to have their illegal cargoes offloaded. After some resistance, the Coast Guard captured the smugglers and their vessels but not before the rum runners tossed 850 cases of brandy, champagne, and whiskey overboard. This scene repeated itself several times throughout the 1920s since the shallow water over Stellwagen Bank was an ideal place to anchor. Located at the mouth of Massachusetts Bay, Stellwagen Bank National Marine Sanctuary sits astride the historic shipping lanes and fishing grounds for such ports as Boston, Gloucester, Plymouth, Salem, and Provincetown. These ports have been centers of maritime activity in New England for hundreds of years. Over time accidents have occurred and ships have sunk leaving virtual time capsule on the seafloor. As a result, the sanctuary has become a repository for this nation's maritime heritage resources, with shipwrecks serving as discrete windows into specific moments of our sea-going past.